We love cupcakes, but who wants 24 cupcakes when only 2 people in your house will be eating them( which means 22 for me and 2 for my son … not good). So instead of baking them we decided to play with them. 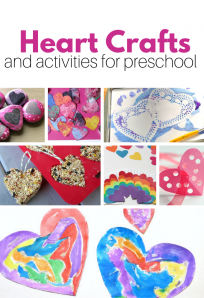 This pretend play incorporates sensory, learning shapes, and color mixing too. Not to mention it was really fun! Gather your materials. 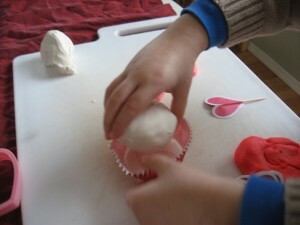 You will need some red and white playdough, some fun cupcake liners, cake picks ( is that what they are called? 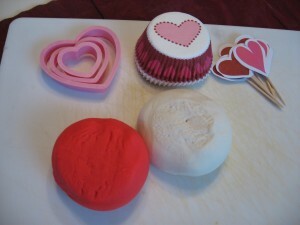 ), a cutting board and heart cookie cutters. You can also add sprinkles, fancy plates and muffin tins! 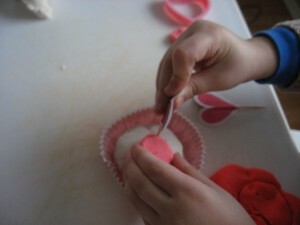 Start by mixing some of the red and while to make pink playdough. 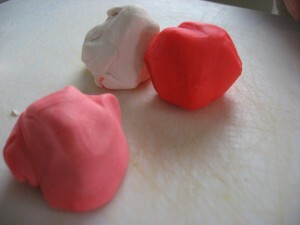 Normally I make my own playdough but I wanted this color mixing lesson as part of the play, so I bought white and red dough, it’s hard to make true white playdough at home. If you want to make your own here are my favorite recipes. We rolled it into balls and popped it in a liner. 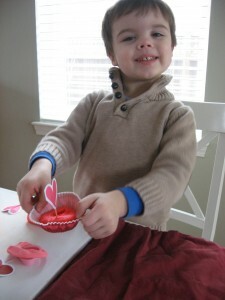 Made hearts for the top – I did one to show him all the options while and he ran with it. Keep playing- this cupcake cost me $38 dollars! Good thing the playdough , liners and pics together only cost $3.99! There is no right or wrong way to play – just explore, have fun and remember to keep playdough far away from carpet, it’s such a pain to get out. 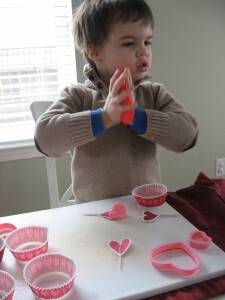 Mr. Cookie Baker was an instant hit at our house. 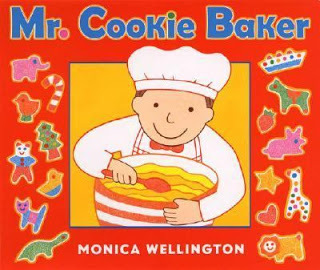 The book is about who else, Mr. Cookie Baker and it shows the reader how he makes cookies from scratch, ices them and sells them. It”™s a great book to explain baking and bakeries. My son loves the part where Mr. Cookie Baker eats a cookie after a long hard day and then says goodnight. I like the illustrations, they are bold and detailed without being cluttered and can almost tell the story all by themselves. Be warned though reading this will almost definitely make you crave a cookie or two. 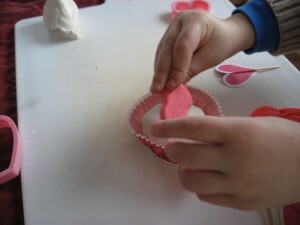 Previous Post: 5 Senses – Touch Activity! This is FANTASTIC!!! I love it. Now if only it weren’t snowing so I could get out to get some playdough. 🙂 hmm… maybe we have what we need to make some and we can play with color by adding more/less red to the dough.?? 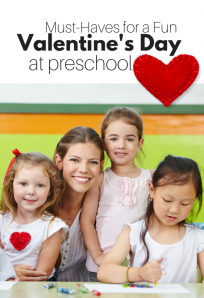 I can always count on you for something fun to do with my little one. THANKS. I really appreciate you! .-= Jackie Lee´s last blog ..Content Creation Series ~ Creating Podcasts =-. What a great idea to use cookie cutters with playdough… not sure why I never thought of this… I’m sure we used to do so when we were kids. Where’s my brain? LOL. I’ll definitely be trying this out with my daughter – she LOVES to bake with me, so this should be fun, too! .-= Ashley´s last blog ..Online Money Making Resources =-. Such a great idea!! I can’t wait to do this with my kids. So true – much better than making cupcakes that I would end up eating. Thanks for the tip! .-= Heather´s last blog ..Logo Design =-. Such fun! 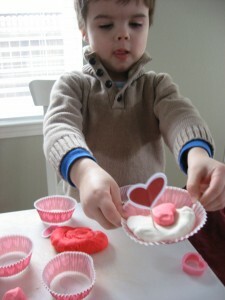 We also enjoy using mini-muffin pans, small loaf pans, and/or tart pans with play dough to pretend to bake. .-= Scott´s last blog .."But You Sit Behind Us" =-. Perfect timing! 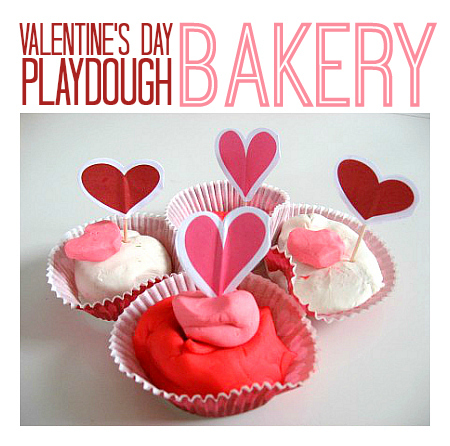 I’m just out of playdough and these will be perfect for making with the daycare kids and playing with next week! .-= Michelle´s last blog ..stART ~ The Three Little Kittens =-. Sooooo Cute! 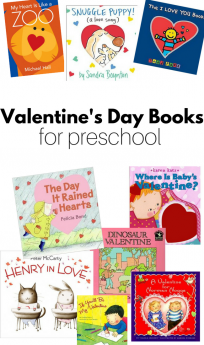 I love it…and I think kids will love it too! .-= Bre´s last blog ..Hunting for Hearts =-. .-= Beverly´s last blog ..Friday Class Room #8- Music =-. I just want to say that I really love this site. I have children ages 10, 6, 6, and 4. Dr. Alice Wilder turned me on to it. Please keep the energy high and keep doing great work. Oh, and keep having fun.